The latest restaurant to truly knock my socks off is Bambudda, a year-old Gastown gem located on the corner of Powell and Columbia. 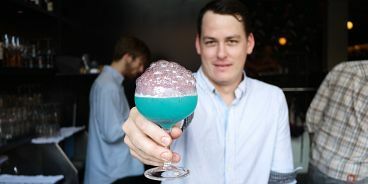 You can’t miss it from the street with its wide open 20-foot-doors, blue suede booths and dangling Chinese lanterns. Ridiculously creative cocktails begin the Bambudda experience with a bang. Buck Friend, the very talented bartender behind these original drinks (who’s sadly moving on very soon…but not to fear, his cocktails will remain), recommends the Bubble Tea made with rhubarb bitters and hibiscus bubbles. Thanks to a little curacao, the beverage is bright blue with pink bubbles on top. Another stand-out is the Lazy River served in a sunscreen bottle. Both are far too easy to drink. Bambudda’s “modern Chinese” food is also stand-out. The flavours pop and dishes are plated beautifully. Try the eggplant with crunchy sprouted grain, the wood-ear mushroom salad and as much else as your tummy can handle.